Nice work. Thank you for the pattern link. I may make some of these for Christmas gifts and secret santa. Another great useful, practical, MUCH NEEDED at my house, idea. Thanks for sharing the link and I love the one you made. It's even in the right colors to go with our kitchen. great colors,and looks like it holds a lot of bags!! thank you! 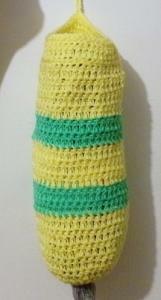 Thanks for posting the link for this pattern.. love the colors you picked out very nice..
Nice colors. You did an awesome job.